Ever wonder if your coffee is still hot or did you wait too long and it’s now cold? You can wonder no more. 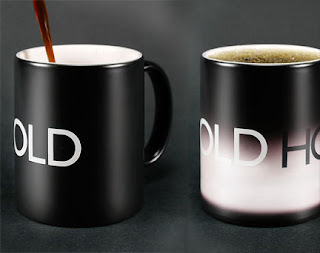 This great little mug will let you within some range what the temp is of your drink. I know it would be perfect for me. I’m kinda like Goldilocks with my coffee; it has to be just right. This gem would save my poor tongue from getting burnt when it is too hot. What a great partner it would make with this mug. You can purchase the mug here.